Let us set a scene for you: You’ve got brand-new pool table and you’ve got friends to play billiards with. One problem though… you have no idea how to set up the balls. Well set the drink down — but not on the pool table; we wouldn’t want to ruin the cloth — because we’ll let you in on how to rack a pool table correctly. Basic rules: Eight ball is played with fifteen numbered object balls and the cue ball. The shooter’s group of seven balls (one through seven or nine through fifteen) must all be off the table before the attempt to pocket the eight ball to win. Shots are called. Get a ball and put it at the tip of the rack. Or the apex, if you want to get technical. Make sure the 8-ball is in the center of the rack. Middle of the third row. It’s the first ball directly below the apex ball. Put a stripe and a solid at the bottom corners. It doesn’t matter which goes where, as long as you’ve got one of both. Place all the other balls at random. As long as you follow rules 3 and 4, all other balls can be in random fashion. Make sure not to put it in any intentional pattern. The balls need to be racked as tightly as possible. It’ll break better this way. The apex ball goes on the foot spot. It’s the spot on the pool table designated to guide the positioning of the rack. Basic rules: Nine ball is played with nine object balls numbered one through nine and the cue ball. The balls are played in ascending numerical order. The player legally pocketing the nine ball wins the rack. If possible, get a diamond rack. A 9-ball game has a different pattern — 1-2-3-2-1. You can use a triangular rack to rack the game, but it won’t be as tight. Grab balls numbered 1 through 9. The one ball goes at the apex. The nine ball goes in the center. All other balls are random. Just like 8-ball, rules dictate that all balls must not be placed in an intentional pattern. Apex ball goes on the foot spot. Basic rules: Ten ball is a call shot game played with ten object balls numbered one through ten and the cue ball. The balls are played in ascending numerical order and the lowest numbered ball must be contacted by the cue ball in order to establish a legal hit. Grab a triangle rack and set it on the table. Grab balls numbered 1 through 10. One ball goes at the apex. Ten ball goes in the center. All other balls are random, racked tightly. 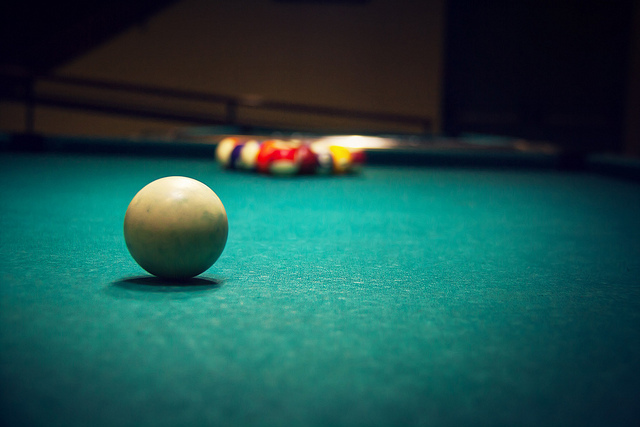 Basic rules: 14.1 Straight Pool, also known as straight pool, is played with fifteen numbered balls and the cue ball. Each ball pocketed counts as one point and the first player to reach the required score wins the match. 14.1 is continuous in that after fourteen balls are pocketed, they are re-racked and the shooter continues. Put them in the rack at random. As always, keep it tight. Position the apex ball on the foot spot. When the balls are being re-racked, omit the apex ball if only fourteen are being racked.